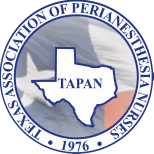 The Texas Association of PeriAnesthesia Nurses, as a component of the American Society of PeriAnesthesia Nurses, advances nursing practice through education, research and standards. Part of this mission is accomplished through providing scholarships and educational grants to our members. TAPAN offers educational grants for members attending continuing education programs and educational scholarships for members pursuing advanced degrees. Application must be submitted at least 30 days prior to date of CE offering.